Judy Baar Topinka’s son, Joseph, presenting the artwork to Nasatir. Inset: Judy Baar Topinka speaking at a JUF rally in support of Israel in 2012. LATE ILLINOIS STATE TREASURER and comptroller Judy Baar Topinka loved estate sales. And if she saw something she thought might make a good gift for someone, she bought it. When her son, Joseph, discovered the Israel poster in the photo above among her possessions, he knew it belonged at JUF. 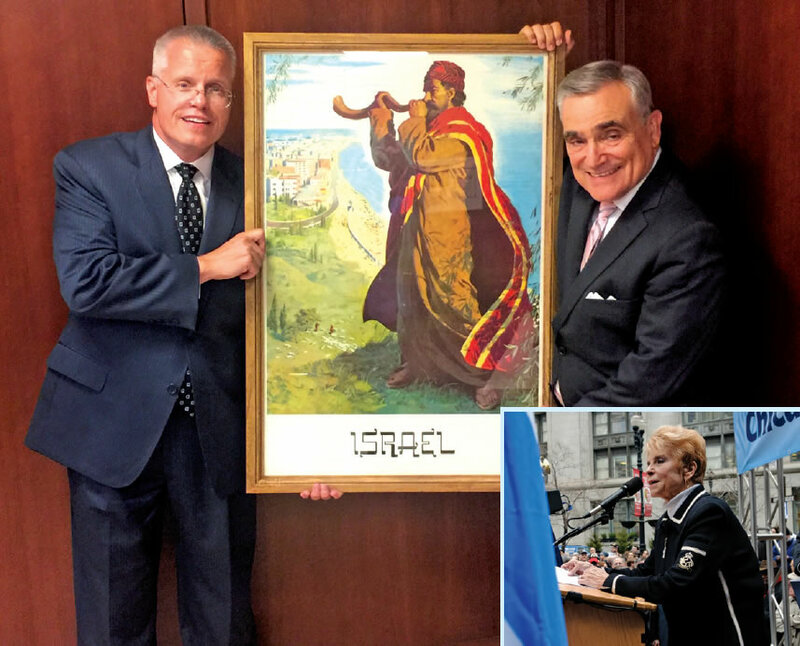 In July, Joseph presented it to JUF President Steven B. Nasatir, who fondly remembered Judy as “a true friend of Israel and the Jewish people.” Among several examples were her purchases of Israel Bonds for the state. She also was an increasingly rare type of leader, Nasatir said, eager to engage people of all backgrounds and willing to work with members on both sides of the aisle to make the state and its residents better. Many instances of those efforts are detailed in Joseph’s young-adult civics text and biography about his mother, Just Judy: A Citizen and Leader for Illinois. 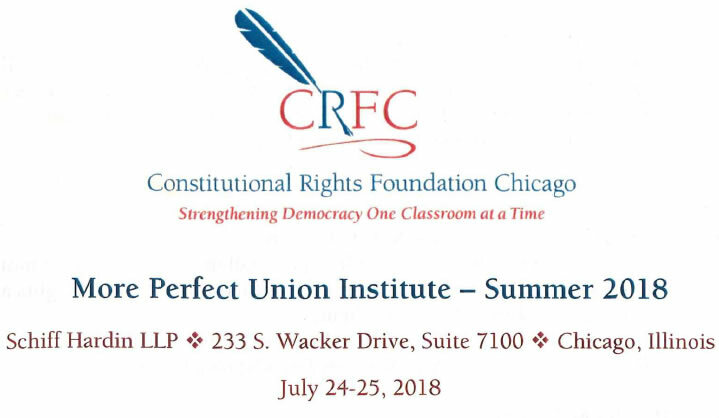 I was fortunate to be invited to give a presentation at the Constitutional Rights Foundation Chicago event about the book, Just Judy, A Citizen and Leader for Illinois on Wednesday, July 25, 2018. 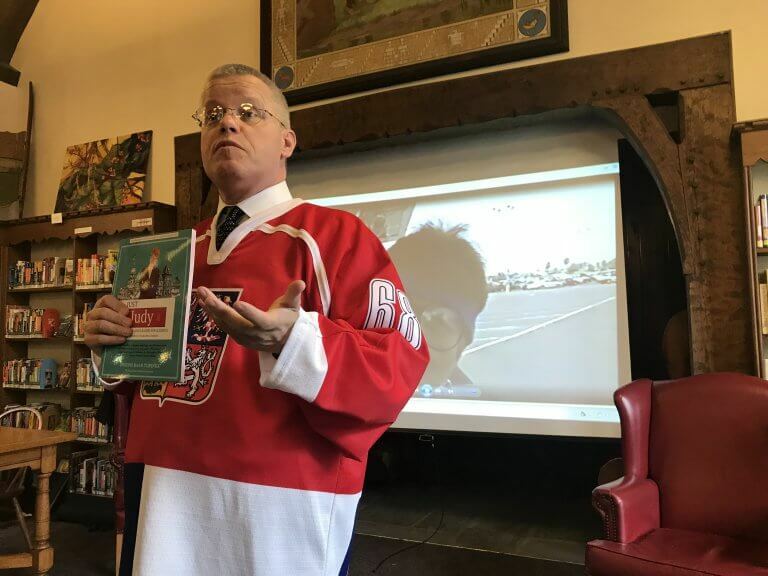 Joseph Baar Topinka joined Shalom Klein on his weekly radio show, Get Down To Business, to discuss “Just Judy” and the legacy of Judy Baar Topinka. 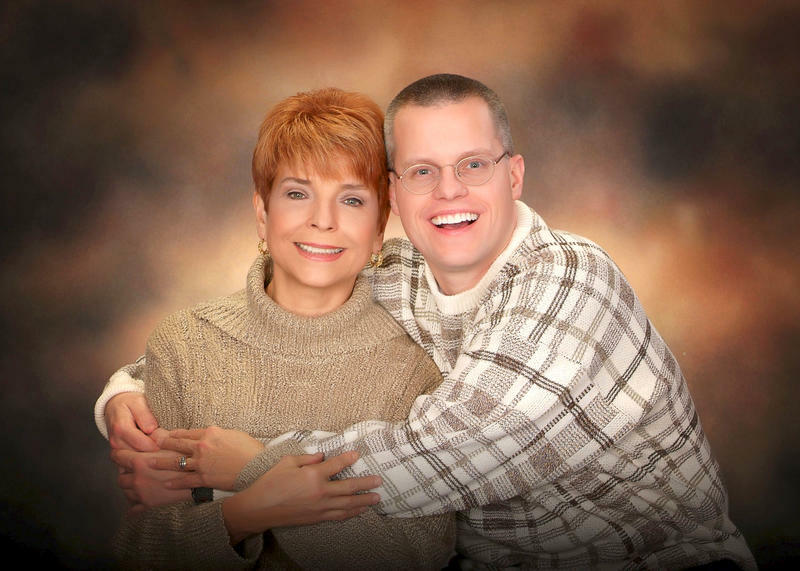 Suburban Chicagoland News created a nice write up about Joseph Topinka’s new book Just Judy. When Sam Madonia speaks, people listen. And sometimes they want to listen again and again. Now you can, with AM 1450 Springfield On Demand and his interview of Joseph Baar Topinka regarding the book Just Judy.